Coping with household water scarcity in the savannah today: Implications for health and climate change into the future. Earth Interact. 2015 doi:10.1175/EI-D-14-0039.1, in press. 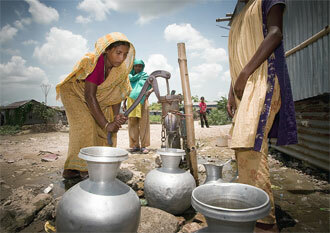 Even as millions live without reliable access to water, very little is known about how households cope with scarcity. The aims of this research were to: 1) understand aspects of water scarcity in three rural villages in southwestern Uganda; 2) examine differences by demographics and type of source; 3) assess relationships between different factors related to water access; and 4) explore coping strategies used. Health implications and lessons learned that relate to future climate change are discussed. Over half of the households relied on seasonal water sources. Of those accessing ‘permanent’ sources, ~30% experienced inaccessibility within the past two weeks. Self-reported better access to water was correlated with minutes spent walking to source and to some degree with the source being more public or shared. Those without access to public sources tended to migrate as the primary coping strategy. Water sharing and reciprocity appears crucial between wealthy and poor households, however, those from outside ethnic groups appear to be partially excluded. Middle income households followed by the poorest had the largest reliance on purchasing water to cope. These findings underscore how access to water resources, particularly in times of insecurity, involves social networks.